The Pennsylvania Fish and Boat Commission (PFBC) is asking anglers and boaters to help prevent the spread of an invasive species, the New Zealand Mudsnail, by cleaning their gear after leaving one waterway and before entering another. Cleaning fishing gear and boats is always a good practice to avoid introducing invasive species. PFBC biologists collected mudsnail specimens this month in the Little Lehigh Creek west of Emmaus, near the Wildlands Conservancy. The snails are tiny — measuring less than one-quarter inch — “with a relatively long, narrow, spiral shell that is generally brown to almost black in color. Like other aquatic invasive species, they disrupt ecosystems by rapidly multiplying and competing with native species for space and food,” a PFBC press release states. “Based on studies conducted in western U.S. streams, if the population grows quickly, they could become the dominant organisms in the benthic – or bottom dwelling – community, upon which many other species depend for food,” says PFBC Lead AIS Ecologist Bob Morgan. The first known occurrence of the snail in Pennsylvania was discovered about five years ago in Spring Creek, Centre County. Gear should be visually inspected and any clinging matter should be removed and disposed of in the trash. 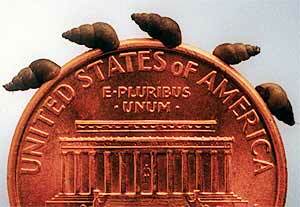 To kill Mudsnails, three methods are effective. Gear can be frozen for a minimum of eight hours, or it can be soaked in very hot water with detergent – maintained at 120°F to 140°F – for ten minutes. This last method is not recommended for Gortex. Also, a 2005 study by the California Department of Fish and Game showed that Mudsnails can be killed by soaking gear for five minutes in a one-to-one solution of a commercial product, Formula 409® Cleaner Degreaser Disinfectant, and water. After soaking gear for five minutes, thoroughly rinse it with plain water. Simply spraying gear with the disinfectant or the mixture does not work. Also, general cleaners such as regular off-the-shelf Formula 409 have not been shown to be effective against Mudsnail. The PFBC asks that if you suspect you have found the New Zealand Mudsnail (or any other invasive species) in another waterway, report your information at: http://pfbc.pa.gov/forms/reportAIS.htm . For more information about New Zealand Mudsnail, visit https://seagrant.psu.edu/section/fact-sheets-brochures and scroll down to the Mudsnail link.